Hair follicles extracted via FUE. The follicle on the top has 3 hairs and the one on the bottom has 2. Please note the curliness of the grafts. Dr. Sean Behnam uses different techniques and tools to successfully maneuver the skin and extract these curly follicles. The recipient area, which is the area that is to be filled with transplanted hair, is numbed. The recipient little sites are created. This indicates how many grafts are needed. Once the design is complete and the recipient sites have been created, the donor area is numbed. The donor area is the area where all the graphs are extracted. All numbing is done using local medication. The decision to create the recipient sites first and then extract the grafts from the donor area is very important. By creating the sites first, this reduces the out of body time, increasing graft survival. What are the graph survival rates between FUE and the strip method? Graph survival rate using the Strip procedure is about 90-95%. Graft survival rate for the FUE is generally thought to be lower about 85-90%. Dr. Sean Behnam has done extensive research in this area to increase graft survival rates of FUE. One of the most important aspects that has increased graft survival rate has been the decision to make the recipient sites first, before extracting. Traditionally in FUE, the grafts are extracted and then the donor sites are created. Although this does create a shorter day, this increases the out of body time of the grafts. There have been two studies* that have proven that if graphs are placed back in the body within 12 hours, 95% will grow. Our grafts are placed back in the body within 1 to 3 hours so our patients have the best possible graft survival rate. Because of this, our graft survival rate comes very close to that of a strip procedure. Also, at times the technicians can start placing the grafts while the grafts are being removed which reduces out of body time even more. What is the typical FUE Procedure like? The typical day begins with Dr. Sean Behnam and the patient discussing the plan where the grafts will be placed. Pictures are taken of the recipient area and the donor is shaved. Then the recipient site is numbed with lidocaine. 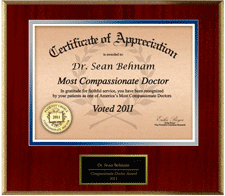 Dr. Sean Behnam spends the amount of time needed to create the recipient sites. The time needed depends on the patient’s hair loss. Areas of baldness take less time than filling areas of thinning. This is because in areas of thinning the recipient sites must be created such that there is no damage to the existing hair. 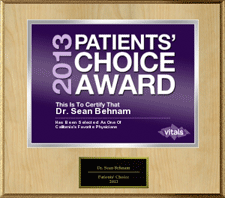 Regardless, Dr. Sean is committed to take as much as needed to create the sites to give the best possible outcome. Once all the sites are created for the day, there is a bagel break where the patient is given a snack and restroom break if needed. The donor area is numbed and extracting begins. Multiple breaks are taken. Lunch is on us and usually taken between 2-3 pm. After lunch the grafts are placed and the procedure is typically done around 5-6 p.m.
How are the areas numbed and how much numbing is used? Typically a combination between short and long acting lidocaine is used to numb the area. Dr. Behnam uses special techniques to numb the nerve root. Imagine a tree and imagine numbing the root of a tree and the numbing medication then expands to all the branches and leaves. So rather than numbing each individual leaf, everything gets numbed by targeting the root. This is a technique usually allows Dr. Behnam to use less numbing medication than what is used for the average root canal. Is Follicle Unit Extraction more or less safe than the strip procedure? 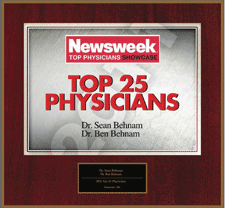 They are both safe Dr. Sean Behnam has never had an issue with safety in any of the procedures he has performed. 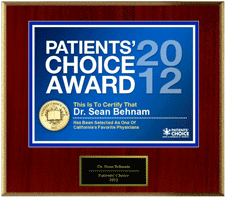 How many years has Dr. Sean Behnam been performing FUE’s? 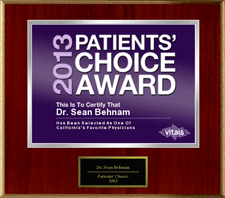 Dr. Sean Behnam has been performing FUE’s since 2009, and now 60% of the procedures he performs are FUE. How long does it take for the donor area (back of the scalp) to heal? It typically takes about 10 days for the back of the scalp to heal. Below is a time lapse of a patient of mine which demonstrated the healing of the back of the scalp. It is important to note that this person’s second day of procedure was performed 5 days after so everything had to be shaved over again. However it does show that by day 10 the back of the scalp had healed nicely. Can women also do the FUE procedure? Yes, many women do the FUE procedure. Women with longer hair styles can cover shaved area on the back of the scalp. However, some women do not want to shave the large area of the donor area that needs to be shaved so they opt to have a strip procedure. In the picture below you can see that this person very easily covers the area where the grafts have been removed. How many grafts can be removed typically in one day? Dr. Sean typically removes 600 to 1,200 grafts in one day so 1,300 to 2,000 grafts typically takes 2 days. One of the most important aspects of the graft extraction is the quality of the grafts. Dr. Sean takes his time, carefully choosing quality grafts and the angle to extract minimizing transection rate. The number of the grafts that are acquired is the number that can be transplanted safely. It must be done without creating a bald spot in the donor area and the grafts must be carefully be placed in the recipient area. Nothing is ever rushed. Quality work takes time. Transection is when a hair shaft is cross cut or dissected during the punching or the extraction process. This damages the grafts such that it cannot be transplanted. Dr. Sean Behnam has a transection rate of less than 2% this is an important reason why he only does one case a day and also only does 600-1,200 grafts per day. Dr. Sean would rather prolong the case over a two day procedure rather than increase transections rates. After every graft is removed they are then checked under a microscope as well to make sure that they are healthy and undamaged. How does Dr. Sean’s philosophy of performing only one case a day impact results? This is very important aspect of quality control. At the end of the day what really matters to the client and Dr. Sean is the quality of the hair transplants. This is why Dr. Sean only performs only one case a day so he can be fully focused on extracting the best quality grafts for the procedure. How does Dr. Sean’s philosophy on only doing 600-1,200 grafts per day impact results? It is very easy just to randomly make 1,000-2,000 punches however, getting great quality grafts is what matters most. This is why Dr. Sean does not rush. If the patient’s hair is curly, Dr. Sean may only be able to get 600 grafts, but the 600 will be the best quality grafts that can be transplanted. If the patient’s hair has no curl, the number could double. Regardless of the number, Dr. Sean takes the amount of time needed. Performing one surgery per day gives him the freedom to work slowly with attention to detail. What instruments does Dr. Sean use to create the punches?. Dr. Sean uses an automated device that he has altered and upgraded. It contains 0.9-1.1 millimeter punch at the tip of the device that is connected to a motor. The rotational motor is controlled by a pedal so Dr. Sean can control the speed of the rotation of the punch. Controlling the speed allows Dr. Sean to extract the grafts with minimal disturbance to the surrounding tissue. This has worked very well. What size punches are used to extract grafts? Typically 0.9- 1.1 millimeter punches are used to punch out grafts. The size of this punch depends on the size of the hair shaft. Each patient is different so the punch size is customized for every patient. Can African Americans also have FUE done? 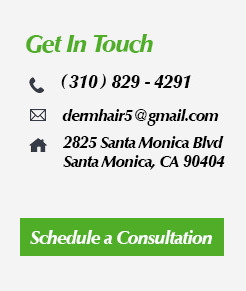 Yes, Dr. Sean Behnam specializes in ethnic hair and curly hair. He has a lot of experience and he has a lot of patients. How is Ethnic / Curly hair different from Caucasian / Straight hair? Curly hair requires the punch to be curved every time. This significantly slows down the process. However, what’s really important is graft quality. Dr. Sean has performed many transplants on patients with curly hair with great success. How many grafts can be obtained with curly hair in one day? It depends on the degree of curl. If it is significantly curly about 500-600 grafts can be removed in one day. Is there a difference between curly hair and wavy hair? Yes, wavy hair just has a slight curve to it, but curly hair has a significant curl to it. More grafts can be extracted with wavy hair in one day than curly hair. Has Dr. Sean Behnam performed a lot of Hair transplants of African American, using FUE technique? Yes, Dr. Sean has performed many hair transplants on curly hair. Is there a linear scar associated with the FUE method? No, the entire goal of the FUE is to individually remove one graft at a time and not get the linear scar, However, individual small scars are created. The scars are less detectable because it is dispersed throughout the back of the scalp rather than one concentrated line. What kind of scarring should be expected for FUE procedure and how could it be minimized? When FUE is performed a graft is punched out, that little punch even though it’s one millimeter or smaller creates a small scar. We have learned that a product called Acell can actually reduce or minimize the scarring. Please see next question. What is Acell and how does this impact scarring on the back of the scalp? Acell is a extra cellular matrix is a revolutionary breakthrough in wound healing. Extra cellular matrix is the material that holds the cells together. Acell cell is extracted from the lining of pig bladder. There are many things we have learned from using Acell on the back of the scalp after FUE procedures. Before the use of Acell the visual punches would make a distinct circular scar. However, after using Acell we have learned that the scars typically decreased by about 20 to 40 %. This is huge. Also, the border of the scar is less distinct. Further, there are some studies that show that hair may actually regenerate through the scar. Although Acell is not magic, it has worked well to reduce scarring. Can FUE be used to extract grafts from other parts of the body? 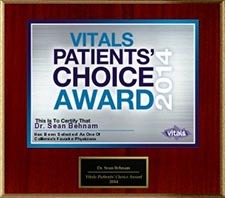 Yes, Dr. Sean Behnam now uses FUE to extract grafts from the chest area. However this is done on selective patients who do not have adequate donor hair at the back of the scalp. When can one see results from the FUE procedure? Typically the results from both FUE and strip are about the same, it takes about 8-18 months to see full results. What is the no shave technique? There is actually some shaving involved the no shave technique, this refers to shaving layers of the back of the scalp leaving areas that the hair unshaved such that immediately after the procedure, the shaved areas may be hidden by the longer unshaved hair. In detail the back of the scalp is divided into 10 horizontal lines of 1 centimeter wide in diameter. Every other line is shaved leaving gaps of scalp that are not shaved and coverer the shaved areas. The grafts are then extracted from the areas that are shaved. What are the pros of the no shave technique? Typically this is done for cases less than 1,000 grafts. It can make it less evident that the patient has had a procedure and assist in spreading the extracting areas. For larger procedures (2,000 grafts) this is not a good idea as it may leave zebra like patterns on the back of the scalp. Can FUE be used to cover old hair transplants scars? Definitely. Yes, this is done routinely where FUE grafts are taken and placed scars. This requires the use of Acell, an F.D.A. approved wound healer that regenerates tissue through blood vessel formation. Prior to Acell, graft survival in scar tissue was about 50%. Ever since the use of Acell that is injected into the scar this has increased to 70-75%. 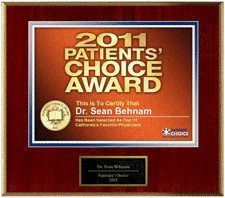 Dr. Sean Behnam has performed many scar revisions using FUE. This does work well. How often does Dr. Sean Behnam do FUE hair transplant? Now performs FUE about 3 to 4 times a week. I am interested in a consultation for FUE, How would it work? During the consultation Dr. Sean Behnam reviews all the detailed aspects of FUE with you and makes sure you are a good candidate for the procedure. He discusses all the pros and cons, advantages and disadvantages of the procedure. The consultation typically takes about 1 to 1 hour and a half depending on the patients. Like our procedures, the consultations are not rushed. The time is taken to give each patient specific, clear information to help decide how they would like to address their hair loss. Everybody meets Dr. Sean Behnam, he does the analysis on the donor area, inspects and measures the recipient area. Patients who are not transplant candidates are educated on the latest remedies. The consultation is free, to schedule call (310) 315 4989 . Where the office is located? What is VIP FUE Hair Transplant Procedure entail? For those who want the utmost privacy, we can arrange to close our clinic to all other functions. So while the procedure is performed, no other patients or non-essential personnel will be present. This package will also include house call for follow-up visits.For details please call 310-315-4989. I am a celebrity and do not want to be seen. Is this possible? Yes, the office is situated such that there is direct access from parking as well as from the street that goes directly into the office on the third floor as needed, Parking is underground. For more information please contact the office. Has Dr. Sean performed FUE on different ethnicities? Yes, Dr. Sean has performs FUE procedure on all ethnicities and has experience on all types of hair. Can I fly into Los Angeles to have my procedure performed? Yes, we have many patients that fly into Los Angeles to have this FUE performed. Since this procedure does not require sutures and staples to be removed, all follow up visits may be done with Skype, face time, or phone conversations. The process is very user-friendly for out of town patients. Does Dr. Sean use the Neo Graft? Yes, Dr. Sean Behnam has the Neo Graft, and uses it when it best suits the surgery. Dr. Sean has 4 different machines that can be used for the FUE procedures. Not every machine is suited for every procedure. Depending on the curliness, width and the depth of the grafts, different machines are suited for different hair type. So during the consultation Dr. Sean will discuss with you which machine fits your hair the best? About 20% of procedures are done using the Neo graft machine. For curly hair, how does Dr. Sean Behnam curve the punch in order to extract the full graft intact? Dr. Sean has done countless experiments in maneuvering the skin and straightening the grafts. The extraction of curly hair requires an extra step that reduces the curl beneath the skin. This has worked very well. Dr. Sean has been doing FUE on African Americans since 2010 and is constantly perfecting methods of extracting curly hair.